Fibromyalgia is a neurosensory disorder characterized by widespread muscle pain, joint stiffness, and fatigue. The condition is chronic (ongoing), but pain comes and goes and moves about the body. The disorder is often misdiagnosed or unrecognized and is and often complicated by mood and anxiety disorders. According to the American College of Rheumatology diagnosis criteria, fibromyalgia affects about 3-5% of women, most of whom are between ages 20 and 50, but only 0.5- 1.6% of men. Some experts feel the actual rate is much higher. Fibromyalgia is more prevalent in adults than children, with nine times more women affected than men. People with fibromyalgia are most likely to complain of three primary symptoms: muscle and joint pain, stiffness, and fatigue. At one time, fibromyalgia was thought of as a psychological disorder. Today, although the exact causes of fibromyalgia are not known, the disorder is believed to be caused by the interplay of biological, psychological, and sociocultural variables. Biological variables appear to be involved in the way the central nervous system (brain and spinal cord) process pain. People with the fibromyalgia appear to have a lower than normal threshold for perceiving and tolerating pain. Researchers have found that these people have more of an excitatory neurotransmitter called substance P in their spinal fluid. Substance P is involved in the transmitting and processing of pain signals to and from the brain. In addition, people with fibromyalgia seem to have low levels of the neurotransmitters serotonin and norepinephrine. The regulation of dopamine, another brain neurotransmitter, also appears to be faulty in people with fibromyalgia. Taken together, these abnormalities appear to lower the threshold at which the individual feels and tolerates pain. The tendency toward developing fibromyalgia is thought to have a genetic component. Individuals who have a close family member with the disorder are more likely to develop it themselves. Interestingly, physical trauma (e.g., automobile accident), which was once thought to be a trigger for fibromyalgia has been definitively shown not to initiate the disorder. Psychological factors also affect the development of fibromyalgia. Emotional stress appears to be a trigger for the development of fibromyalgia in a person who is already biologically at risk. In addition, many people diagnosed with fibromyalgia have psychiatric mood disorders (e.g., depression bipolar disorder), anxiety disorders (e.g., generalized anxiety disorder, obsessive-compulsive disorder, panic disorder, posttraumatic stress disorder, social phobia) or eating disorders (e.g. anorexia nervosa). Interestingly, depression, and anxiety disorder have been linked to abnormalities in some of the same neurotransmitters that are thought to be involved in pain perception (e.g., serotonin, norepinephrine, dopamine). Pain is the major symptom of fibromyalgia, with aches, tenderness, and stiffness of multiple muscles, joints, and soft tissues. The pain also tends to move from one part of the body to another. Although the pain is present most of the time and may last for years, the severity of the pain changes and is dependent on individual patient perception. Symptoms of fatigue may result from the individual's chronic pain coupled with anxiety about the problem. Almost all individuals with fibromyalgia complain of difficult sleeping or sleep that is not restful. Other common symptoms are tension headaches, recurrent abdominal pain, irritable bowel syndrome, numbness or tingling of the extremities, and problems with memory. Stress, anxiety, depression, and lack of sleep can increase symptoms. Intensity of symptoms is variable ranging from gradual improvement to episodes of recurrent symptoms. There are no specific laboratory tests to diagnosis fibromyalgia. Diagnosis is difficult and frequently missed because symptoms are vague and generalized. Tests will be done to rule out other conditions with similar symptoms before a diagnosis is made. Coexisting disorders such as rheumatoid arthritis, systemic lupus erythematosus, or Lyme disease may further complicate the diagnostic process. In 1990, the America College of Rheumatology developed standards for the diagnosis of fibromyalgia. According to these standards, a person can be diagnosed with fibromyalgia if he or she has widespread pain in combination with tenderness in at least 11 of the 18 sites known as trigger points. Trigger point sites include the base of the neck, along the backbone, in front of the hip and elbow, and at the rear of the knee and shoulder. These standards have been criticized by some physicians as being too narrow for use in clinical practice. As of 2009, standards for diagnosis were under review. There is no known cure for fibromyalgia; therefore, the goal of treatment is successful symptom management. Treatment usually requires a combination of pharmaceutical therapies, appropriate exercise, proper sleep hygiene, and good nutrition. As of early 2009, he only drug specifically approved for treatment of fibromyalgia by the United States Food and Drug Administration was pregabalin (Lyrica), an anticonvulsant whose mechanism of action in the treatment of fibromyalgia was not completely understood. Antidepressant drugs that alter the levels of neurotransmitters in the brain help improve symptoms of pain and disrupted sleep in many people with fibromyalgia. There are several classes of antidepressants, each with its own benefits and side effects. Selective serotonin reuptake inhibitors (SSRIs) such as fluoxetine (Prozac), paroxetine (Paxil), fluvoxamine (Lovox), citalopram (Celexa), escitalopram (Lexpro), and sertraline (Zoloft) increase levels of serotonin in the brain. Selective serotonin/norepinephrine reuptake inhibitors (SNRIs) such as venlafaxine (Effexor), duloxetine (Cymbalta), and milnacipram (Savella) are quite similar to SSRIs and are often prescribed for individuals with depression who also have extreme fatigue or chronic pain or who do not respond to SSRIs. Atypical antidepressants such as bupropion (Wellbutrin), nefazodone (Serzone), mitazapine (Remeron), and trazodone (Desyrel) have fewer sexual and gastrointestinal side effects. They may cause drowsiness and aid individuals with insomnia. Tricyclic antidepressants (TCAs) were the first major class of antidepressant developed. In low doses, they often improve pain symptoms in people with fibromyalgia. They are less expensive than SSRIs but have more severe side effects, which may include persistent dry mouth, sedation, dizziness, and cardiac arrhythmias. TCAs include amitriptyline (Elavil), imipramine (Tofranil), doxepin (Sinequan), protriptyline (Vivactil), and trimipramine (Sumontil). Other types of drugs used to treat specific symptoms include muscle relaxants, anticonvulsants, and short-term use of drugs to treat insomnia. Nonsteroidal anti-inflammatory drugs (NSAIDs) and opiod analgesics do not have much effect on fibromyalgia pain, and opioid drugs carry the risk of physical addiction. They are not often prescribed for fibromyalgia pain. Any disorders, such as rheumatoid arthritis, depression, anxiety, or chronic fatigue syndrome must be treated along with fibromyalgia symptoms. Nonpharmaceutical treatments that may be helpful include heat and occasionally cold applications. A regular stretching program is often useful. Aerobic activities focusing on increasing the heart rate are the preferred forms of exercise over most other forms of exertion. Exercise programs need to include good warm-up and cool-down sessions, with special attention given to avoiding exercises causing joint pain. The diet should include a large variety of fruits and vegetables which provide the body with trace elements and minerals that are necessary for healthy muscles. Cognitive-behavioral psychotherapy, which helps the individual change negative thoughts and behaviors about their disorder, can be quite helpful. Individuals who take charge of and try to work through their pain often have fewer and milder symptoms and a better quality of life than those who focus on their disability and discomfort. Evidence of effectiveness of these complementary treatments is either mixed or insufficient to draw any firm conclusions; they may help some people and not others, or their benefit may be purely psychological. Individuals using complementary therapies should tell their physician, as some of these therapies, especially herbal supplements, have the potential to negatively interact with conventional pharmaceuticals that may be prescribed. Fibromyalgia is a chronic condition. Symptoms sometimes improve and at other times worsen, but they often continue and must be managed for years. There is no known way to prevent fibromyalgia. However, remaining as healthy as possible with a good diet, safe exercise, and adequate rest and stress reduction may decrease the likelihood that the disorder will be triggered. An acute recurrent inflammatory disease involving one or a few joints, believed to be transmitted by a tickborne virus. The condition was originally described in the community of Lyme, Connecticut, but has also been reported in other parts of the United States and other countries. Knees, other large joints are most commonly involved with local inflammation and swelling. A chemical in the brain that transmits messages between neurons, or nerve cells. Changes in the levels of certain neurotransmitters, such as serotonin, norepinephrine, and dopamine, are thought to be related to depression. A hormone released by nerve cells and the adrenal medulla that causes constriction of blood vessels. Norepinephrine also functions as a neurotransmitter. A disease characterized by inflammation and degeneration of connective tissue in multiple joints at a young age. 5-Hydroxytryptamine; a substance that occurs throughout the body with numerous effects including neurotransmission. Inadequate amounts of serotonin are implicated in some forms of depression. A chronic, inflammatory, autoimmune disorder in which the individual's immune system attacks, injures, and destroys the body's own organs and tissues. It may affect many organ systems including the skin, joints, lungs, heart, and kidneys. Ostalecki, Sharon. Fibromyalgia: The Complete Guide from Medical Experts and Patients. Sudbury, MA: Jones and Bartlett Publishers, 2008. "CAM and Fibromyalgia." National Center for Complementary and Alternative Medicine. July 2008 [cited February 25, 2009]. http://nccam.nih.gov/health/pain/fibromyalgia.htm. "Fibromyalgia." MedlinePlus. February 18, 2009 [cited February 25, 2009]. http://www.nlm.nih.gov/medlineplus/fibromyalgia.html. "What Is Fibromyalgia?" National Institute of Arthritis and Musculoskeletal and Skin Disease. February 10, 2009 [cited February 25, 2009]. http://www.niams.nih.gov/Health_Info/Fibromyalgia/fibromyalgia_ff.asp. American College of Rheumatology (ACR). 1800 Century Place, Ste 250, Atlanta, GA 30345-4300. Telephone: (404) 633-3777. Fax: (404) 633-1870. http://www.rheumatology.org/. Fibromyalgia Network. PO Box 31750, Tucson, AZ 85751-1750. Telephone: (800) 853-292- or (520) 290-5508. Fax: (520) 290-5550. Email inquiry@fmnews.com http://www.fmnetnews.com. National Fibromyalgia Foundation. 2121 S. Towne Centre Place, Suite 300; Anaheim, CA 92806. Telephone: (714) 921-0150. Fax: (714) 921-6920. http://www.fmaware.org/. diffuse aching pain and stiffness in the muscles and joints. A common syndrome of chronic widespread soft-tissue pain accompanied by weakness, fatigue, and sleep disturbances; the cause is unknown. Compare: fibrositis. Fibromyalgia is a disorder of unknown cause characterized by chronic widespread aching and stiffness, involving particularly the neck, shoulders, back, and hips, which is aggravated by use of the affected muscles. The American College of Rheumatology has established diagnostic criteria that include pain on both sides of the body, both above and below the waist, as well as in an axial distribution (cervical, thoracic, lumbar spine, or anterior chest). Additionally, point tenderness must be found in at least 11 of 18 specified sites. Tender points are sharply localized and often bilaterally symmetric. 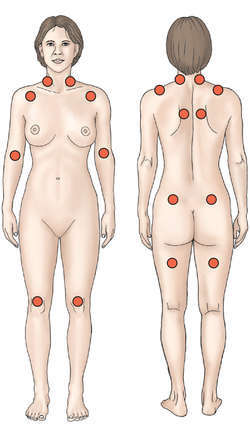 Some points may correspond to sites of pain and others may be painless until palpated. Usually associated fatigue, a sense of weakness or inability to perform certain movements, paresthesia, difficulty sleeping, and headaches are found. About one fourth of patients with fibromyalgia receive partial or total disability compensation. Fibromyalgia frequently occurs in conjunction with migraine headaches, temporomandibular joint dysfunction, irritable bowel syndrome, restless legs syndrome, chronic fatigue, and depression; symptoms are typically exacerbated by emotional stress. The prevalence in the U.S. is estimated at 1-3% of the population, with all races and socioeconomic strata affected about equally. Most patients (90%) are adult women. The onset of symptoms usually occurs before age 50. The disorder is chronic but not progressive. Routine hematologic, serologic, and imaging studies yield uniformly normal results. However, the sleep EEG typically shows intrusions of alpha waves into non-REM sleep and infrequent progression to stage 3 and stage 4 sleep. One third of patients with fibromyalgia have low insulinlike growth factor (IGF) levels. Elevation of cerebrospinal fluid substance P, depression of cortisol production, and orthostatic hypotension have also been reported. Most patients experience moderate to severe disability, but symptoms can usually be mitigated by treatment. Effective treatment programs include education, a regular program of low-impact aerobic exercise, and physical therapy as needed. Cognitive therapy and group therapy are often helpful. About one third of patients respond to pharmacologic agents such as antidepressants (amitriptyline, fluoxetine) and muscle relaxants (cyclobenzaprine). A syndrome marked by chronic, widespread pain in the muscles and soft tissues with defined points of tenderness and often multiple other symptoms, such as fatigue, sleep disturbance, anxiety, and bowel dysfunction. a form of nonarticular rheumatism characterized by musculoskeletal pain, spasms, stiffness, fatigue, and severe sleep disturbance. Common sites of pain or stiffness include the lower back, neck, shoulder region, arms, hands, knees, hips, thighs, legs, and feet. These sites are known as trigger points. Physical therapy, nonsteroidal antiinflammatory drugs, and muscle relaxants provide temporary relief. Also called fibrositis, soft tissue rheumatism. A multifactorial condition involving any combination of these symptoms; disordered sleep, low stamina, cognitive difficulty, and chronic diffused aching and stiffness of muscles and soft tissue. May involve presence of tender points, typically distributed to all four quadrants of the body. Fibromyalgia is a condition in which objective findings are limited, but subjective fatigue, pain, and distress are often significant. Essential to its management are reassurance that it does not cause harm, cognitive behavioral therapy, and reasonable participation in physical activities or physical therapy to prevent deconditioning. Muscle aches may be eased by massage, and stretching and yoga help to maintain range of motion. Drug therapies include oral pregabalin, topical capsaicin, anti-inflammatories, antidepressants, muscle relaxants, trigger point injections, and/or narcotic analgesics. Referral to a rheumatologist, physiatrist, psychologist, psychiatrist, or pain management therapist is sometimes necessary. Definition: Pain is considered widespread when all the following are present: pain in the left side of the body, the right side of the body, above the waist, and below the waist. In addition, axial skeletal pain (cervical spine, anterior chest, thoracic spine, or low back) must be present. In this definition, shoulder and buttock pain is considered as pain for each involved side. “Low back” pain is considered lower segment pain. * For classification purposes, patients are considered to have fibromyalgia if both criteria are satisfied. Widespread pain must have been present for at least 3 months. The presence of a second clinical disorder does not exclude the diagnosis of fibromyalgia. SOURCE: American College of Rheumatology, Multicenter Criteria Committee, Arthritis Rheum 1990; 33(2):160–172, with permission. fibromyositis. See also FMS and myodysneuria. A common syndrome of unknown cause of chronic widespread soft-tissue pain accompanied by weakness, fatigue, and sleep disturbances; characterized by chronic widespread aching and stiffness, involving particularly the neck, shoulders, back, and hips, which is aggravated by use of the affected muscles. Fibromyalgia frequently occurs in conjunction with migraine headaches, temporomandibular joint dysfunction, irritable bowel syndrome, restless legs syndrome, chronic fatigue, and depression; symptoms are typically exacerbated by emotional stress. n a debilitating chronic syndrome characterized by diffuse or specific muscle, joint, or bone pain; fatigue; and a wide range of other symptoms, as well as tenderness on palpation at various sites. Q. Is it Fibromyalgia. My uncle is suffering with extreme body pain. Doctors say it is fibromyalgia. His sedimentation rate and creactive protine is 3 times high than normal. would this confirm the diagnosis of FM? What is its actual symptom? A. There's not one diagnostic test that can confirm fibromyalgia, and the diagnosis is made on a clinical basis according to the signs and symptoms of this disease (extreme fatigue, pain in different areas in the body and more). However, a high CRP level and sedimentation rate does confirm some sort of inflammatory process is going on and can be a clue to the diagnosis. Q. Is it Fibromyalgia. My uncle is suffering with extreme body pain. Doctors say it is fibromyalgia. His sedimentation rate and c reactive protine is 3 times high than normal. would this confirm the diagnosis of FM? What is its actual symptom? Q. how do you treat Fibromyalgia? A. I agree seeing a doctor is important! Almost everyone I have contact with has had to use prescription medications b/c OTC did not work for them. One friend said alevee gave her a lillte help. I have found walking alittle everyday helps even if for only 20 minutes there are so many different opinions and i educated myself from site for fibromyalgia and tried some of the reccommendations. BUT for me a posotive outlook and support has been my greatest help along with my faith! I take 8 different medications but only 2 just for the fibro. Good Luck and if you want to talk please email me! Patients who are suspected of having fibromyalgia need a licensed health-care practitioner to authorize their FM/a Test. Other conditions such as hypothyroidism, polymyalgia rheumatica, RA, lupus, and other inflammatory or autoimmune disorders sometimes mimic fibromyalgia, but these conditions can be ruled out by a physical exam and blood tests," explains Dr.
Brady makes an important distinction between classic fibromyalgia and other conditions that can present like fibromyalgia, such as hypothyroidism, small fiber neuropathy, lupus, rheumatoid arthritis, and stealth infections. Fibromyalgia is a disorder marked by widespread muscle pain and tenderness, fatigue and sleep problems. This may result from common triggers for these psychiatric conditions and fibromyalgia, like early-life stress or trauma," Dr.
We are all speaking with one voice with the same message: We accept that fibromyalgia is neither a distinct rheumatic nor mental disorder, but rather a duster of symptoms spanning a broad range of medical disciplines. How am I going to weed out those who have fibromyalgia from those who are faking and seeking disability status? Compared with the controls, patients with fibromyalgia had significantly increased detection thresholds to warm and cold when quantitative sensory testing was used, while the depressed patients had no significant difference compared with the controls. Most of the research findings in fibromyalgia point to a malfunctioning of the central nervous system (CNS), which includes the brain and spinal cord. Diagnosing fibromyalgia has been controversial because there are no specific laboratory tests to identify the disorder. The National Fibromyalgia & Chronic Pain Association provides support, education, advocacy, and research of fibromyalgia and chronic pain illnesses. com), the first test to objectively diagnose fibromyalgia.